A graduate of Concordia University in St. Paul, Minnesota, and Concordia Seminary in St. Louis, Pastor Adams was born in Colorado Springs, Colorado, but raised in Wisconsin. His wife, Laura (Vogt) Adams, is a Minnesota native and is also a graduate of Concordia University St. Paul. They were married on November 28, 1981. They have three children - Amanda (husband Kyle Worner), Nicholas and Kevin. Rev. Adams has served at Faith Lutheran since 2010. He previously served at Trinity Lutheran Church in Salina, Kansas (1997-2010), St. Matthew Lutheran in Mapleton, Iowa (1990-1997) and Grace Lutheran in Alma Center, Wisconsin (1986-1990). Rev. Adams served his vicarage years at Calvary Lutheran Church in Sioux City, Iowa (1984-85). He was ordained into the Holy Ministry on July 1, 1986 at St. John's Lutheran Church in Merrill, Wisconsin, his home church. Rev. Adams has done graduate work at Concordia University, Seward, Nebraska, in the Family Life Ministry Program, and in Pastoral Care and Counseling. 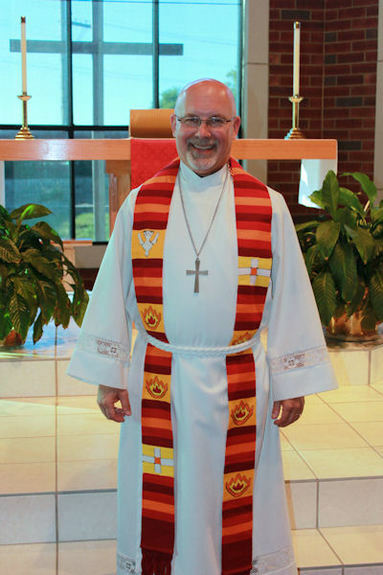 He has served on the Children's and Family Life Committee of the Kansas District of the Lutheran Church-Missouri Synod and as a Circuit Counselor. From 1973-76 he served in the U.S. Army and from 1992-1996 as an Army Reserve Chaplain in the Iowa National Guard.